The Tainan Airport operates both civilian and military flights. Does Tainan even have an airport? Well, for those of us who are woken up daily by the screech of F-16s, it should come as no surprise that Tainan does indeed have an airport. At this time, however, there are no international flights and even domestic flights have become quite limited since the opening of the High Speed Rail. For the most part, civilians wishing to connect to Tainan by air are out of luck. People wanting to access Tainan from international departure points are best advised to arrive in Kaohsiung or Taipei and then take ground transportation to Tainan City. While the Tainan Airport is largely a military one, it does still handle two domestic routes for civilians. They run three daily flights to and from Magong City in the Penghu Archipelago and two daily flights to and from Kinmen Island on Uni Air. Both places make interesting getaways from Tainan City. Check the airport flight status to be sure of the schedule. Just this year, the airport was given the go-ahead to allow international flights, but so far none have been put on the schedule. 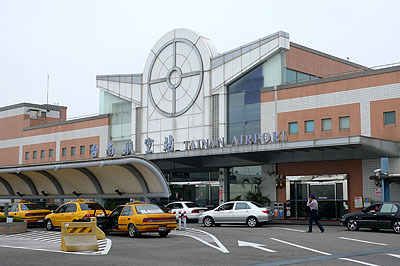 The Tainan Airport opened in 1949, and was once one of Taiwan’s major airports. Service from Taipei’s Songshan Airport was common for over fifty years until competition from the High Speed Rail put an end to all commercial flight services in 2008. The airport has two runways. Both are operated by the air force. Since the airport is largely a military operation, the terminal is quite far from the airfield and shuttle buses must be taken from the gate to the airplane. The airport is just south of the city center and would be an inexpensive taxi ride to and from central areas of the city. It is also serviced by bus number 5 if you wish to use Tainan City bus service. Parking is available at the airport. The first 30 minutes is free. Parking costs NT$30 per hour with a maximum daily fee of NT$280. The airport code is TNN. EDIT May 22, 2013: There is news that beginning on July 18th, 2013, there will be three flights a week going to and from Hong Kong. They will fly on Tuesdays, Thursdays, and Sundays. Osaka (Japan) and Ho Chi Min (Vietnam) flights have been added (current as of August 2017).